Big Swole hanging out at the 2014 V-103 Car & Bike Show | Throttle Life! The Georgia World Congress Center was once again packed with some of the country’s hottest motorcycles and cars for the 11th annual V-103 Car and Bike show. For those that don’t know, the annual V-103 Car & Bike Show is one of the Southeast’s premier car and motorcycle events with an element of hip-hop and R&B entertainment consistently attracting a large audience. How large? This year there was a captive audience of more than 40,000 in attendance – not bad for a one day event. Prime sponsors Mountain Dew and Butler Tires brought out their array of custom cars while celebrity row featured the likes of Diddy, Warren Sapp, Major League Baseball legend Gary Sheffield and V-103’s own Greg Street and Big Tigger all of whom added an element of high-end custom eye candy consisting of Ferrari, Porsche, Corvette, Bentley, and of course the bikes. I’m proud to humbly add my motorcycle club (Iron Bred MC) show up and showed out with our personal motorcycles on display from custom Harley-Davidson’s, to choppers, to metric cruisers. Providing the day’s soundtrack was resident Atlanta motorcycle-set DJ, DJ Dirty keeping the crowd grooving with mixing in an impromptu dance contest. On stage the crowd was more entertained by some of Hip-Hop and R&B’s biggest artists. T.I., T-Pain, Trey Songz, Da Brat, Jermaine Dupri, and several other local artists kept the party going with high energy the minute they hit the stage. 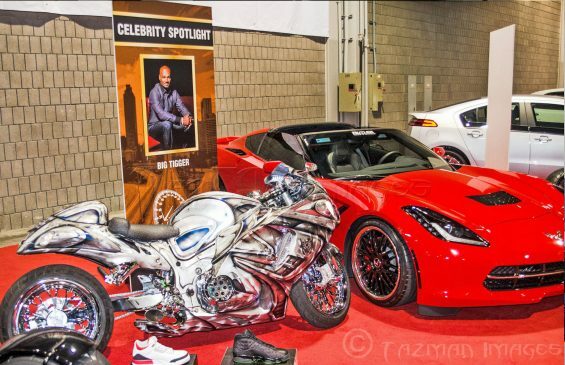 If you are a car- or motorcycle-head, a lover of music, or just looking to catch a glimpse of your favorite celebrity; the V-103 Car & Bike Show is the place to be. If you missed it, you missed it! Photos and coverage courtesy of our special guest contributor David “Big Swole” Rose, President and CEO of Big Swole Productions. For additional photos do yourself a favor and check out the incredible work of Taz Man Images on Facebook.